Yes, I’m going to start off by writing about the weather. So far the pattern this winter has been typical cold weather temperatures for a few days, then a rise to unseasonably warm temperatures, with down pouring rain. The latter is happening today. It’s pretty depressing. But, thankfully, number 1, I don’t have to go out of the house and number 2, I can stay in my night duds all day if I choose. I’ve been in a knitting quandary lately. In case you didn’t know, I am an obsessive knitter. I knit every day. I knit hats, scarves, socks, shawls, cowls and occasionally a sweater. I do wear what I knit and I also give knitted gifts for Christmas and birthdays. I’ve been doing it for years now. And just like the recent weather, I have saturated myself and the family with my wares. So what do I do? I can’t imagine myself stopping my knitting or even taking a break. Besides I have enough yarn in my closet to last a life time, even if I live to be a hundred. I know what you are thinking, “How about charity knitting?” Yes, I suppose I could do that. In fact yesterday, I dove into my knitted items dresser, and pulled out 10 hats, 4 shawls, 2 scarves, and 3 cowls. My sister was visiting, I asked her if she wanted any of them. She kindly took a shawl and hat. I decided to donate the rest. Ross, who champions my knitting, assured me that the Ladies Auxiliary from the local hospital thrift shop would be thrilled to have such beautiful items. I carefully placed each give-a-way item in a pretty shopping bag and off we went. When we got to the shop, the woman at the counter was very friendly and directed us to follow the arrow on the “Donation Drop Off - This Way →” sign. We found our way to the back room. No one was at the counter. Ross rang the bell, but got no response. We waited another few minutes. “Are you dropping off a donation?” she asked. I proudly held up my pretty shopping bag, smiled shyly and nodded my head. She went behind the counter, handed me a tax donation receipt, and took the bag. “Thank you,” she said. She placed the bag on the floor along with a dozen other bags. She said, “How lovely” and again thanked us without looking in the bag. One of the most rewarding pleasures of knitting for others is the same that a gift giver might experience. A thoughtful gift giver takes the time to choose just the right item. The reward is the anticipation of seeing the look on the face of the recipient, hopefully a genuinely excited and happy look. I admit I was disappointed. In my imagined trip to the thrift shop, I could actually hear the ooo’s and ahhh’s as each time was lifted out of the bag. As we left the shop, I said to Ross, “I hope they (meaning my donations) keep someone warm and dry this winter. Especially with this crazy weather. 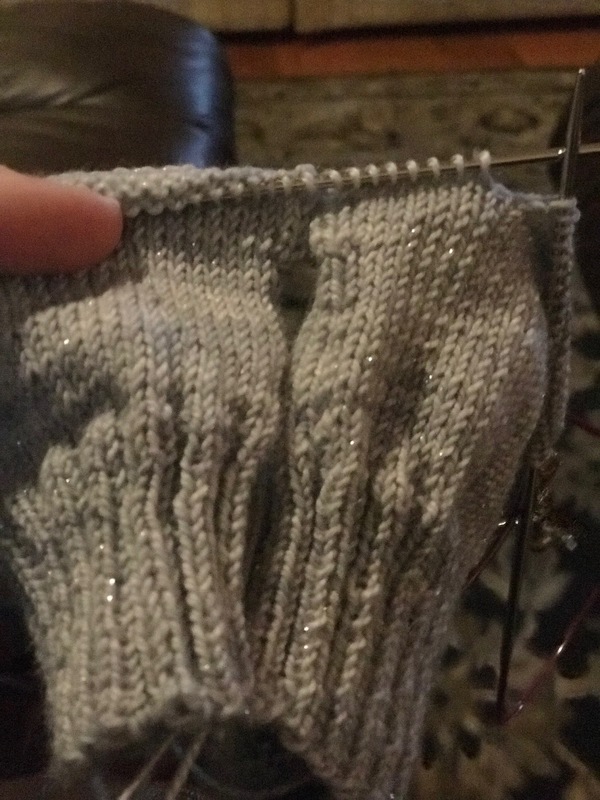 Right now I am working on a pair of socks. The yarn is silvery and it sparkles. And I am genuinely excited and happy as I anticipate how much I will love them. Have you considered starting up an online shop? On Etsy or the like. It's one way to get rid of lots of extraneous knits and make some money on the side. I have considered selling my items. My hesitation, though, are the pattern copyright restrictions. Many designers put an alert on their patterns advising that there cannot be sales of the items made from their patterns. Don't give up trying to find someone to donate your "extras" to. It was crocheted, but years ago when we adopted son at 6 days old, he came with a layette that had been lovingly made by someone that I had no idea who, but donated to the adoption agency. Unfortunately, the blanket got left in a hotel room that we stayed at when he was about 2 and we could never get it back, but we still have the booties and the little jacket type thing. I really appreciated the efforts of whoever made it and that they would be willing to use their time and their yarn to bring joy to someone getting a new member of their family. Maybe look for schools that are doing silent auctions. I bet they would appreciate items. Those socks in the making do look very nice! Yes, I have given some thought to doing craft shows. The items I want to sell would most likely have to be made from my own design. The reason I say that is there may be restrictions from the designers of the patterns I use advising that they would not approve of anyone selling items made from their design. My husband and I used to sell vintage items, mainly jewelry. We sold a few times at flea markets and had a great time doing that.